Whatever action we perform is controlled by the brain. If we have any thought or idea in the subconscious mind, when we concentrate on the same, it manifests as a physical activity without any conscious attempt by the person. This is called idiomotor response. The minute electrical charges in the brain transmit to the muscles through the nerves. The persons who create motivating force through idiomotor response do not have any idea that they are the cause. It is these involuntary muscle movements, which cause the water divining stick to revolve and the planchet to work. The following experiment will prove the effect of idiomotor response. Effect: The pendulum moves in circle or a straight line when you concen­trate on a circle or a straight line. Props: A pendulum suspended on a thread, a chair, and a table. Method: Draw a circle of 6" diameter on a sheet of paper and through the centre of the circle draw a straight line. 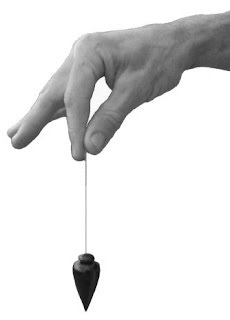 Sit on a chair holding the top end of the thread to which the pendulum is suspended resting your elbow on the table. If you hold the pendulum on the centre of the circle and let your eyes follow the straight line, gradually the pendulum will swing straight along the line. If you let your eyes follow the circle clockwise and concentrate, the pendulum will start moving in a circle, clockwise. Then when again you follow the circle anti-clockwise the pendulum will start moving anti-clockwise in a circle.